CEI Exhibitions is a well-established leader when it comes to award winning exhibitions stands and we offer over fifteen years of exhibition and event industry experience, providing our customers with bespoke designs and custom exhibition stands. We provide more than just the design and build of exhibition, trade show and event stands, we also provide installation and dismantle service, logistics management and storage solutions. At CEI Exhibitions we have an experienced and dedicated team which includes experienced designers, qualified carpenters, dedicated project managers and technicians. Our exhibition stand designers work together alongside to provide you with the best solution to meet your unique needs, requirements and budget. Our exhibition team are always on hand to provide sound advice, make recommendations and answer questions, ensuring that you can make your choice and place your order with complete confidence at all times. 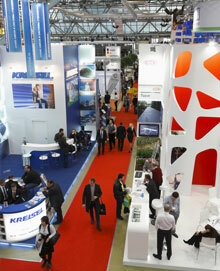 CEI Exhibitions is a name you can trust when looking for award winning exhibition stands. Our team takes the time to learn about your company, your clients and the types of events you attend, ensuring that your display stands out over your competitors. We have a proven track record when it comes to innovative design, build, project management and transportation of exhibition stands. Whether you would like a quote, ask a question or get some essential advice, feel free to contact our team.